When I first saw the monogrammed mugs from Anthropologie I immediately fell in love. I just needed to have them for my home. But then I thought it would be way cooler to make them myself. It’s a great recycling project for thrifted white mugs. Besides that I absolutely love the fact that the mugs are different sizes and that you can see that the letters are drawn by hand. It makes it so much more personal! 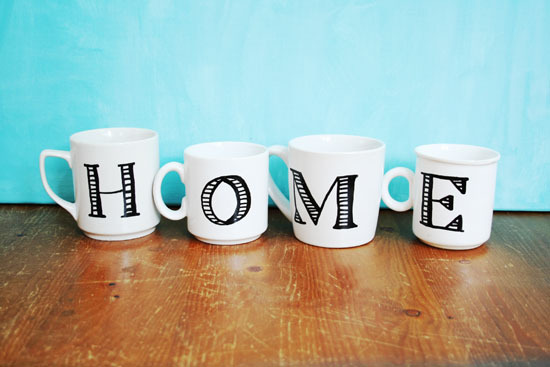 This ‘home’ mugs are coming on display in my new home! 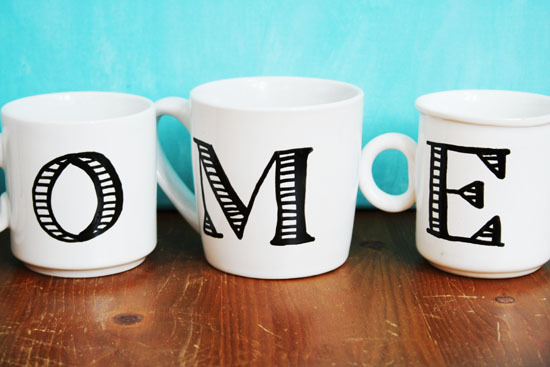 Learn how to make these cute Anthropologie inspired monogrammed mugs after the jump. . .
Clean the mugs really well. Now draw your letter on the mug with the ceramic marker. You can use a soft pencil to sketch on the mug first. Bake in the oven according to the instructions on your ceramic marker.